I was wishing, and hoping, and praying– everything for the winter weather to finally hit us in Virginia. I am not a warm weather girl by any means. Luckily for me, this weekend was finally cold! I was so happy. Then my husband came home from riding ATV’s and was confused as to why I was buried in comforters and quilts, up to the neck, in our bed while working on my latest post. Duh, because it’s cold, and I can cozy up and finally e-n-j-o-y. He just doesn’t understand. While I totally appreciate all my hoodies right about now, there is nothing quite like cozening up under my quilt to do anything– reading, writing said post, recipe drafting– many wonderful things are born from under my special spot. PSA: this is a no judging zone– yes, that’s meant for all you thinkers who do a better job outside of your ‘nest’. Wonder what else gets me thinking cap going? Cozying up to a big bowl of hearty soup. 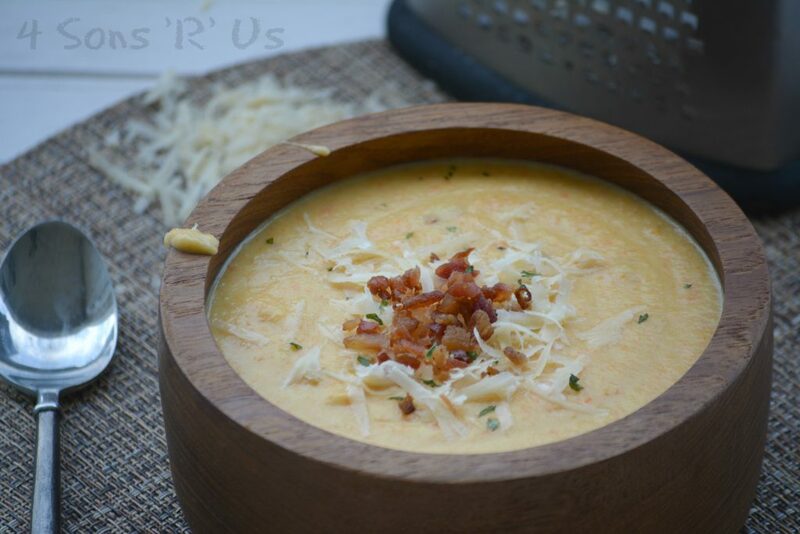 A steaming bowl of Asiago Bisque is just what the weather ordered. 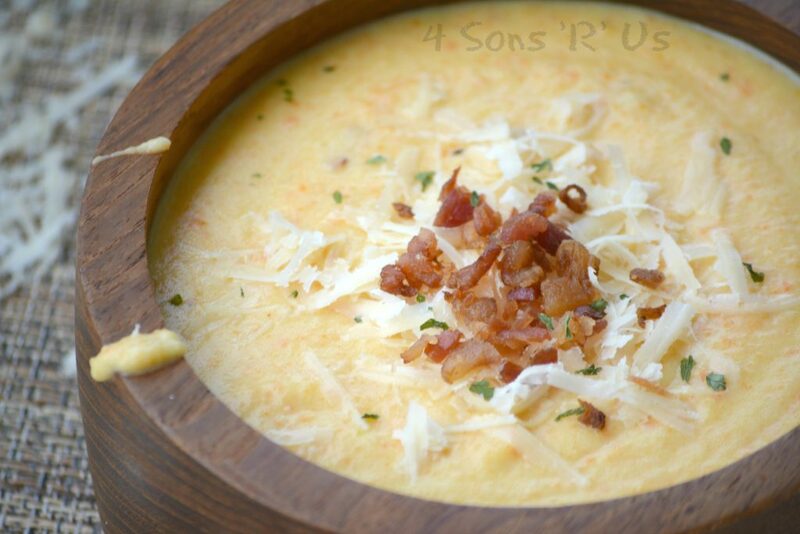 It’s loaded with veggies and given a heaping helping of indulgent Asiago cheese before being pureed to perfection. Topped with shredded Asiago, crispy crumbled bacon and parsley– it’s a creamy dream in a bowl. 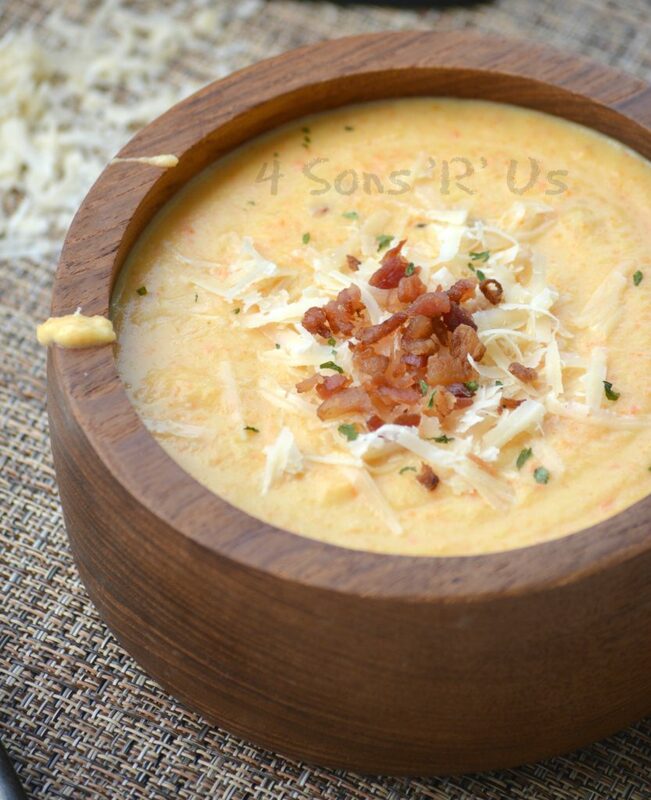 Get your own easy bowl of cold weather comfort food with this Asiago Bisque. A hearty cold weather soup that's embodies many comforting flavors before being blended into one smooth consistency. In a dutch oven, or large pot, melt the butter over medium high heat, watching carefully so it doesn't burn. As soon as the butter's melted, add in the onions, celery, and carrots and saute, stirring occasionally, until tender. Stir in the potatoes, wine, and stock. Reduce to a simmer, over medium low, cover, and continue cooking for 20 minutes. Remove the pot from heat and stir in the cream and Asiago, continuing until the soup's smooth. You decide the consistency-- serve as is, or use an immersion blender to churn it up until it's one creamy consistency. Garnish with bacon and more cheese before serving. To make this soup vegetarian-- use vegetable broth and omit the bacon. Wow, does this sound good! Also a perfect starter for a dinner party – yeah, the one I always think I want to have but never get around to – with the good dishes, all the courses and well behaved guests and family, lol! 🙂 In my dreams, right! But in the meantime, I’d love this cozied up in my fave chair, the tv and fire going! What kind of wine did you use? Definitely want to try this! I just use a generic white cooking wine, found near the olive oil and vinegar in my local grocery store. Any dry white should work if you prefer cooking with or have the real deal handy.